Isn’t it always the case that we only ever seem to pay attention to something when it goes wrong? The scaffolding industry is no different. Timber scaffold boards are always looked upon as being “OK” until they fail. As well as taking everyone by surprise, people then start looking for someone to blame! In the world of roofing, scaffold boards are vital to doing our job. As well as scaffolding, they are often used on site for a variety of other functions – walkways across muddy ground and other kneeling boards etc. Broken scaffold boards can be the cause of serious accidents on construction sites and the majority of injuries happen when boards used in “platform brackets” break during normal work activities. 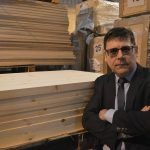 Everyone seems to think that a plank of wood with a metal band on each end is always going to be a “good” scaffold board – no matter what price they paid for it or where it came from. How wrong they are. There is also confusion surrounding the so-called “Grade A” boards. Clearly, like most things, there’s more than first meets the eye with timber scaffold boards, and given the safety implications, it pays to know your facts. The scaffolding industry has been using “Grade A” boards for decades. And because failures are still – thankfully – a fairly rare occurrence, everyone accepts that Grade A boards are OK. However, in actual fact, Grade A boards are made from “normal” sawmill production, which typically contains between 5% and 10% of “reject” boards. As these boards would never pass the British Standard, it’s little wonder that a few of them break in use, each year. Given that “Grade A” boards are not to be trusted, we should only look to use “BS” boards – those that meet all of the requirements of, and have been graded to the rules of BS 2482: 2009. This particular standard lays down the specification for what a timber scaffold board should be, and which are then safe to use. In addition to covering size (that is, length, width and thickness, with appropriate dimensional tolerances), it also covers the banding and marking of boards that meet the BS. The end bands must be present at both ends of the scaffold board. They have an important role in protecting the vulnerable end grain of the boards. They should extend around the edges of the board by at least 150mm for 38mm boards, and at least 100mm for 63mm boards. Are these to be trusted too? Yes, “Kitemarked boards” are ones where a third-party Certification Scheme – in this case, one operated independently by BSI – has been applied to the Quality System for producing the boards, so that buyers and users can “trust” the grading and manufacturing process. And what’s more, the Kitemark is not the only Certification Mark out there. Many other choices of Certifier are also possible: all of which are equally valid and equally good, as a reassurance that the boards are made in accordance with the requirements of BS 2482. What sometimes leads to confusion is that it’s not mandatory to have a “Certification Mark” on a scaffold board, even if is it a fully-graded “BS” Board. And yes, it is perfectly valid for a producer to grade and sell boards with end bands that state only “BS 2482” and “support every 1.2m max” on them – without then also having a Kitemark or some other Certification Mark on them! So, the message I want to leave you with is that Grade A boards are ideally to be avoided, as they cannot be fully trusted. All third party certified scaffold boards are sufficient, for example, showing either Kitemark or Q Mark, but to reiterate the scaffold boards must be marked showing BS 2482:2009 on the end bands as a minimum. And, for safety’s sake, it’s vital that you regularly check all scaffold boards for damage, rot or any other feature that may reduce the strength of the board.